Irene Guest House is a lovely bed and breakfast where your hostess Eudore welcomes you with traditional South African hospitality. Irene Guest House is set in a lush garden with aged trees and a sparkling pool where a weary business traveller or tourist can rest after a busy day. All the rooms at Irene Guest House are luxuriously decorated, guaranteed to make all guests feel comfortable and at home. All the rooms are equipped with a TV and coffee and tea facilities. Guest have access to laundry facilities. Our guest house accommoadtion consists of four luxury en-suite rooms in the heart of the village of Irene. * 5km from the ARC, Taurus and Kentron. * 15km from Pretoria CBD. 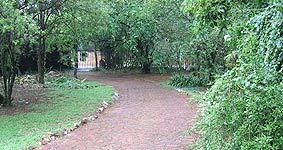 * 35km from Johannesburg International Airport. * Close to all major highways, tourist attractions, Unitas- and major Hospitals. * Secure parking inside property. * Hearty English or Continental breakfast. 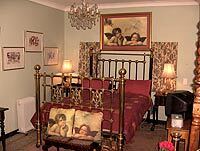 * All rooms equipped with TV and tea/coffee facilities. * Dinner, laundry and airport transportation available on request. All rooms have access to the sparkling pool in the private and secure garden. Breakfast is served in the cosy breakfast room at the guests preferred time. Eudore prepares a delicious dinner on request.